Our January 2014 winter trip was to extreme southeastern Virginia and northeastern North Carolina. A large group – 36 in all – made the trip. 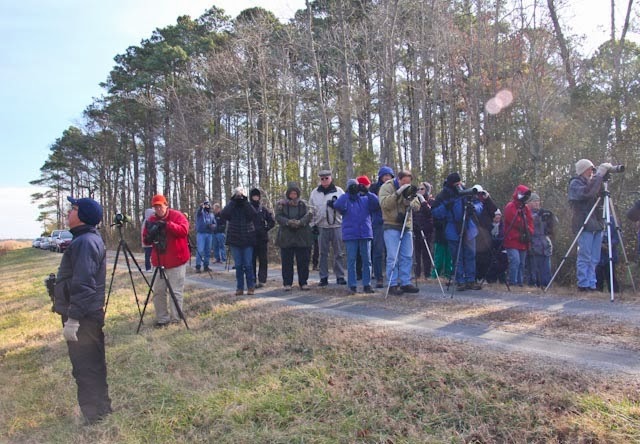 We enjoyed camaraderie that birders promote and the excitement of rare sightings. In recognition of the rare sightings, I dub this past weekend “The Green Dot Trip.” Sibley’s Guide maps a rare bird with a “Green Dot” – hence the name. We had excellent accommodations at the Ramada Inn, in Virginia Beach, enjoying their excellent hospitality, evening meeting room and private breakfast to boot! 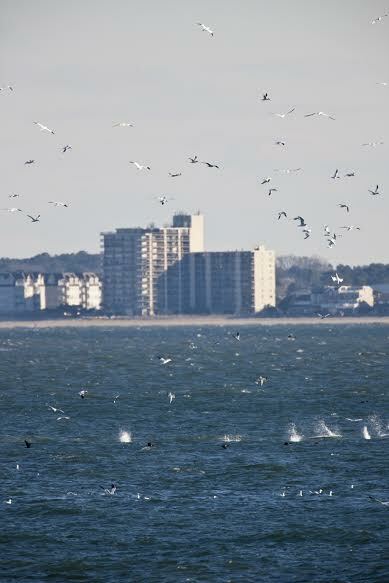 On Friday afternoon, folks began arriving and most headed a few blocks south of the hotel to Rudee Inlet. There, we encountered our first “Green Dot” bird, a King Eider. 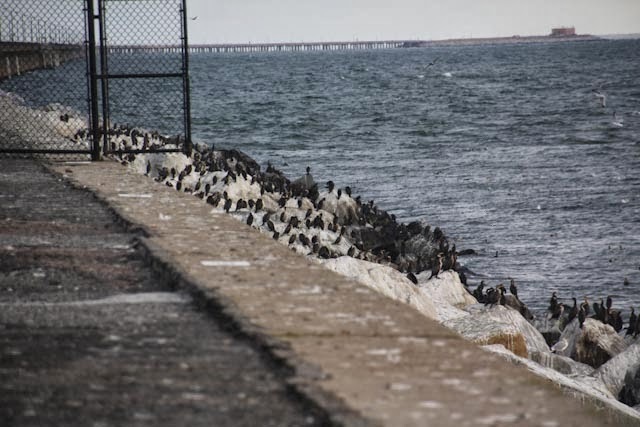 The first-year bird played hide and seek around the jetty and breakwater, but over the course of the weekend all who wanted a look were able to observe to their heart’s content. Surf Scoters, Long-tailed Ducks, Common Loons, Ruddy Ducks and Red-breasted Mergansers were easily seen at very close range. Saturday morning dawned partly cloudy, cold and windy. We formed up at the South Toll Plaza on the Chesapeake Bay Bridge Tunnel. Split into three groups, we motored out with our congenial and accommodating police escorts to explore the tunnel islands. Almost immediately, we observed the first of several awesome Gannet feeding frenzies. Gannets were slamming into a shoal of fish like guided missiles on rapid fire. The spectacle has to be seen to be believed. All four islands awaited us and each island held different sights. Island 3 proved to be the most interesting. Immediately upon stopping, Harbor Seals entertained us as we entertained them. They bobbed about in the swells as interested in us as we were in them. John Haire spotted our second “Green Dot” – an Iceland Gull. Through the snow squalls, we added Black and White-winged Scoters, Greater and Lesser Scaups as well as Great Cormorants, scores of Long-tail Ducks, Common Goldeneyes and Red-breasted Mergansers. Other islands yielded Purple Sandpipers, Herring Gulls and innumerable Ring-billed Gulls. Leaving the bridge, the groups reunited at Virginia Eastern Shore NWR, where we had excellent looks at Bald Eagles and a mysterious “Shadow-belted Hawk.” A short trip further up the peninsula, we briefly toured Kiptopeke State Park where a possible Peregrine Falcon was perched on the cement boats out in the bay. The birding was a bit slow, the Snowy Owls were not to be found (although Royce observed several promising Lowes Foods grocery bags) so most headed back to the mainland and Rudee inlet. There, Killian Robinson spied our third “Green Dot” bird, Glaucous Gull. The gull sat contentedly on the breakwater allowing all comers extended observation opportunity. We met in the evening, shared our stories and prepared for Sunday’s excursion. Sunday morning after a rest stop at Knott’s Island Market, we met Steve and Amy Myers at Mackay Island NWR. Steve and Amy were very friendly and patiently led us into the closed area of the refuge. A Merlin buzzed the convoy before we came to the first pond. There we observed Vees of Snow Geese, several Bald Eagles, hundreds of Tundra Swans, Ruddies, American Black Ducks, Gadwalls and a Nutria that we tried to turn into a Porcupine. Most of the ducks were extremely skittish due to the hunting pressure and continually lifted off as soon as the caravan pulled into sight. Before reaching the next pond, we dismounted and proceeded on foot. A couple of the luckier folks got a glimpse of the Eastern Screech Owl that occupied a Wood Duck house, but it ducked back in and hunkered down out of view. The second pond contained numerous ducks including American Wigeons, Northern Pintails, Green Winged Teals, Tundra Swans, Short-billed Dowitchers, a couple of Snow Geese and more Red-breasted Mergansers. We thanked Steve and Amy and drove over to Back Bay NWR, where the Snowy Owl eluded us yet again. Most of the entertainment there was non-avian. Bottlenose Dolphins frolicked just outside the breakers, rolling onto their backs and leaping clear of the water. Much better than Sea World! A gaggle of over 200 – you guessed it – Red-breasted Mergansers gave us looks at a different feeding frenzy. We also saw a Federal Wildlife Officer conducting a felony stop of a man, woman and their off-leash dog. Howard Coston provided the running commentary as the hapless couple received a ticket for ignoring the Closed Area signs. Most of the group headed back to Rudee Inlet and the hotel but Ron Morris and Bill Gifford visited MacKay at dusk and added King Rail and Great Horned Owl to the trip list. The Unofficial “Trip Trash Bird”……yup, Red-breasted Merganser. Monday morning, we enjoyed another hearty breakfast and said our goodbyes. 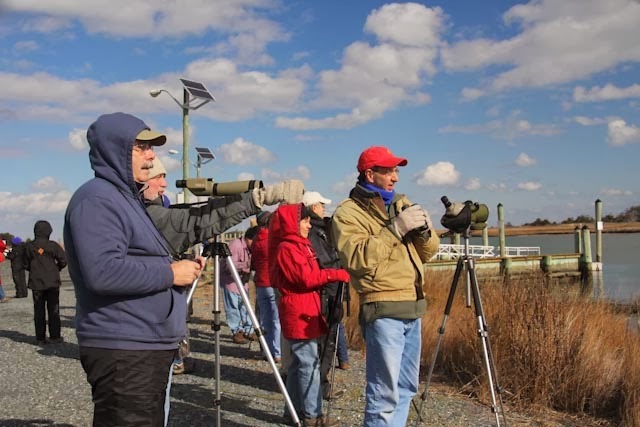 Several groups, however still had an appetite for more birding so they ventured into Eastern North Carolina to chase down a few select birds. Royce, Jim and John scored another “Green Dot” – Say’s Phoebe near Roper. Chuck and Cindy Thompson added Wilson’s Snipe. Cynthia Donaldson, Heather Moir and Becky Clark scouted other locations adding Red-headed Woodpecker. Ron Morris, Bill Gifford, Rob Rogers, Ann Newsome, Sven Halling and Howard Coston hit Bodie Island. We missed the Eurasian Wigeon but enjoyed close looks at several American Avocets and Tree Swallows. 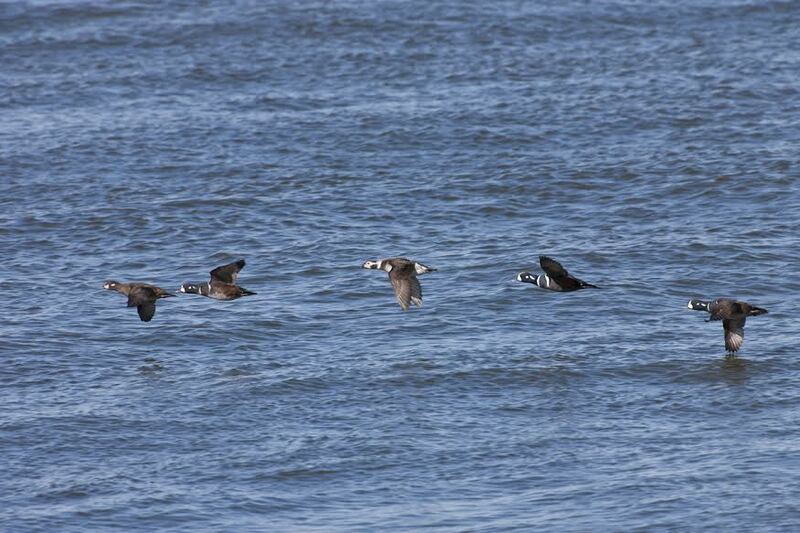 We then headed to Bonner Bridge and added yet another “Green Dot” species, the Harlequin Duck. 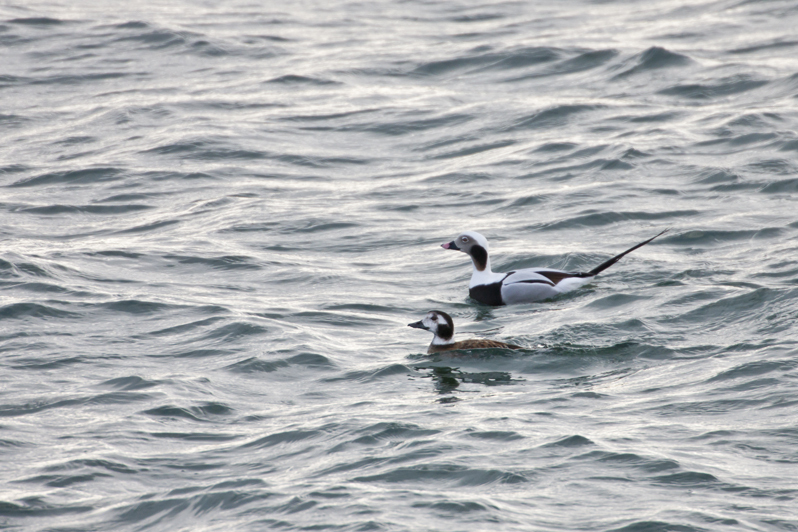 Three drakes and a hen were joined by a lone female Long-tailed Duck swimming in the windswept swells around the bride. The group split up at this point. Howard and Mara-Lea Coston pressed on to Ocracoke, while Ron, Bill and Rob headed west to Manteo. At Hank Griffin’s house, Ron, Bill and Rob added Yellow-breasted Chat and our only “No Dot” Bird – Band-tailed Pigeon. The piece de resistance was enjoyed by the Costons. Their persistence was rewarded by the most sought after bird and last “Green Dot”. Howard and Mara-Lea teamed up with locals Ken DeBarthe & Ruth Fordon to see not one but two Snowy Owls. Most “Chill” Birder – Giri Ramaswami – he enjoys the company of the group and it is hard to beat riding around MacKay Island with the top down listening for Rails and Snow Geese. I’ll Watch Anything Birder – No question – Bonnie Cochran. Who else among us could be entertained just watching……Sand? Keep up the good work, Bonnie! Tail End Charlie Birder – “If you are not the ‘Lead Dog’ – then the view is always the same” does not deter the laid back team of Chuck and Cindy Thompson. They are content to cover the rear and bird at their own speed. The Doug Disney Award – I thought long and hard about this one. What came to mind was the 7 dwarfs – mainly because I was going to name Doug Demarest the “Sleepiest Birder” award. But….in the end I changed my mind because another characteristic manifested itself. Doug wins the “Happiest Birder” award. No matter where he is or what is happening, he seems happy to be right where he is.